Edge is pleased to report on the event: the complete one hour video; the verbatim transcript; a sampling of the press from event articles in Sueddeutsche Zeitung, Spiegel Online, and Stern. Thirty-two years ago, Richard Dawkins published The Selfish Gene, one of the landmark books of the 20th Century. In it, he set forth the "gene's-eye" view of life. (See "The Selfish Gene: Thirty Years On" on Edge). Venter is Director, The J. Craig Venter Institute, and the author of the recently published autobiography, A Life Decoded: My Genome: My Life. (See Craig Venter's Edge Bio Page). BROCKMAN: At "Life, What A Concept!" meeting, Freeman Dyson, who's extremely heretical, basically challenged Richard by saying evolution is now back to pre-biotic stage of communal, horizontal gene transfer, and with the interlude of what he would call the "Darwinian Moment". Richard rebutted that in an email. It's rather exciting reading, and you can get it on The Edge Web site and download it. But the question I have is: Dyson maintains that evolution is now man-made; it's cultural rather than Darwinian, Open Source, communal. Is it? DAWKINS: Right. The questioner points out that John Brockman's Edge Website this year has a question, "When have you changed your mind and why?" And it ended up with the statement that Steven Pinker had changed his mind about whether humans had stopped evolving. I answered the question about changing my mind, and I won't give my answer because it takes too long to explain. However, I will say that in response to Craig Venter today, I am prepared to change my mind, if he gives a better answer to my question about molecular taxonomy. Maybe now is not the time to do it. But I'm on the brink of changing my mind, but I remain highly skeptical as to whether I will in fact have to do so. VENTER: They're thoughtful questions. The first, about the concentration of CO2, is relatively easy to deal with. The KMS of the enzymes and these organisms that exist throughout our planet are able to capture CO2 out of the atmosphere, out of the water. But we don't need to rely on that. We have two phenomenal and, soon a third, point source of carbon dioxide. The two largest are power plants and cement factories. If we could simply capture back the CO2 from those two point sources, it makes it very easy because of the incredible concentrations you have there, and will eventually get in a cycle of a renewable source from that. We also have a third. It's a clustered carbon dioxide from a variety of sources that's been discussed to be pumped down into oil wells or coal beds. So, we are working in one of our programs with BP, trying to look at converting that CO2 back into methane, so you could constantly be in a recycling mode. Once you sequester CO2, we could use that as a source of energy instead of constantly taking more out of the ground. So we have so many incredible point sources of CO2 production right now; that's the least of our worries. In the late summer of 2007 he hosted the now legendary symposium 'Life: What a Concept!' at his farm in Connceticut. This was where six pioneers of science had jointly proclaimed a new era: After the decyphering of the human genome soon whole genomes sequences could be written. That would be the beginning of the age of biology. Digital or biological? There was a moment during Munich's conference about the future at DLD ( Digital Life Design) this past Monday, that felt like the exchage of a baton. After a rather dull discussion about social platforms on the internet a burly man entered the stage, introduced himself as John Brockman and proclaimed that the topic of the hour would now be biology. John Brockman was not just another moderator. In the late summer of 2007 he hosted the now legendary symposium 'Life: What a Concept!' at his farm in Connceticut. This was where six pioneers of science had jointly proclaimed a new era: After the decyphering of the human genome soon whole genomes sequences could be written. That would be the beginning of the age of biology. Brockman brought Craig Venter with him to the conference in Munich—the key participant in the earlier meeting. An American entrepreneur, molecular biologist, and the first person to decode the genome, he personifies the future of biotechnology. Not only that, in recent years Venter has more than doubled the number of genes in the public databases, and right before the meeting in Connecticut, he applied for a patent on the first-ever artificial life form—his Mycoplasma laboratorium, after a self-propagated cell division, will be the first life form to carry a synthetic chromosome. And according to Venter, this will likely be before the end of 2008. Brockman's second guest was enthusiastic about these prospects. British evolutionary biologist Richard Dawkins, known primarily for his books The Selfish Gene and The God Delusion, evoked how seamlessly an eventual "synthetic biology" could fit into Darwin's theory of evolution. For Dawkins, new microbes resulting from human reproduction and microbes fabricated in the lab are equally products of Nature's big experiment—irreversible, yes, but also unstoppable. Since man is at the mercy of the forces of evolution, there is no reason for him to shrink from conducting genetic experiments. Craig Venter, who takes obvious pleasure in his Institute's rapid advancements, assumed a more cautious stance. Fully aware of Europe's reservations towards genetic engineering, he stressed in particular the urgent need for forced intervention in Nature's architecture: the disturbance by humans to the environment is leading to a state of such irreparable damage that the only possible way out of a catastrophe is to push forward. He hopes one day to create a synthetic gene out of his manipulated chromosomes, which for example could reduce our emission of carbon dioxide by converting light into hydrogen. Venter made a good case for his work, denounced the restrictive legislation in genetics that many nations have put in place, and described in detail the future selection process, which at the very least would be less chaotic than before. In his introduction as moderator, Brockman postulated in jest that thanks to Venter's research, before long any pet cat could be transformed into a dog—Venter however distanced himself greatly from any manipulation of animals and spoke only of intervention in molecular biology. Understandably, he won't allow any allusion to his playing a God-like role. Given the countless uninterrupted transitionss in life forms, the very concept of a Creator can only be a myth. Laughing, he bowed down to Dawkins anti-religious polemic The God Delusion: where there is no God, one also cannot play God. Amidst all the enthusiasm for technology, one conversation had more explosive potential than the talking points of all the old and new digital entrepreneurs put together. It is a dense network. At the annual gathering of the digital elite, organized by Burda Media in Munich, cell phone networks have barely enough capacity. WLAN and UMTS are groaning under their full load, as everyone calls, surfs the Internet, types—everywhere you look people have their Smartphones and their laptops, and the crowds of Blackberry devotees now also have an iPhone handy. The event is called DLD. Previously this stood for the "Digital Lifestyle Day," but it is now "Digital Life, Design." The attendees are first-rate—in part because the event is so opportune: many of the international business stars to whom the publisher pays tribute in Munich will subsequently travel on to Davos for the World Economic Forum. And so this year we are running into people like Richard Dawkins and Marissa Mayer of Google in the hallways. And Jason Calacanis, who invented the concept of blogging, chatted with Wikipedia founder Jimmy Wales—oh yeah, and even Naomi Campbell will make an appearance today. The excitement is palpable, latching on to topics like the new markets in India and China, social networks, and above all the mobile network. Although it possible that this last issue seems especially urgent because everyone is constantly trying to get on the Internet, and failing. Amidst all the enthusiasm for technology, one conversation had more explosive potential than the talking points of all the old and new digital entrepreneurs put together. Only hardly anybody noticed. DLD is always so crowded that you have to stand for the interesting events. But when genetics entrepreneur Craig Venter and genetics revolutionary Richard Dawkins, who took on the entire religious Right with his antireligious tome The Selfish Gene, got up on stage yesterday to talk about a "gene-centric world view," noticeably fewer people were standing than is often the case. And this even though their talk contained more revolutionary statements and wild forecasts by far than the other presentations looking toward future. Venter, who last made headlines when he published his personal genome in full on the Internet, made brazen claims, but nobody reacted. Venter insisted that climate change represents a much greater risk to humanity than genetic engineering, which could actually help fight it. For example, with genetically manipulated microbes capable of absorbing CO2: "We can change the environment through genetic engineering." John Brockman, who is the literary agent of both Dawkins and Venter, had the role of moderator, but let Dawkins take over. When Venter began to speak of specific genetically engineered correctives for the environment, however, he abruptly woke up. Somebody once explained to him that when you talk about these subjects in Germany, "it causes an uproar—but everyone appears so calm!" And he is right. The momentum was building and, always one to provoke, Venter was on the ball. Dawkins' was inevitably the role of Devil's advocate and he asked whether Venter considers that all life is technology. "Life is machinery," he answered, "which as we learn how to manipulate it, becomes a technology." Dawkins, who wore shirt sleaves and an eccentric white and gray tie, and who came across a bit like a friendly math teacher, suddenly found himself delivering a tentative warning: the unchecked intermingling of gene pools could have unforeseen consequences. He drew a parallel to the unforeseen devastation that introducing new microbes, plants, or animal species can cause to ecosystems. Dawkins knows what he is talking about—in the '70s he acheived fame with his book entitled The Selfish Gene. At the start of his talk, he declared that "genes are information." From this Venter transitioned into the depiction of a future in which genetic information could be sent over email for the receiver to reassemble as a living being: "We can already reconstruct a chromosome in the laboratory." Last October, the Guardian already reported that Venter would soon be the first to create an entirely artificial life form—something he is accomplishing even as he speaks of a future in which genes are software and humans, at their discretion, can produce life that conforms to their wishes. The question of what happens when genes, which behave all too selfishly in Dawkins' own portrayal of them, breed freely did not come up. 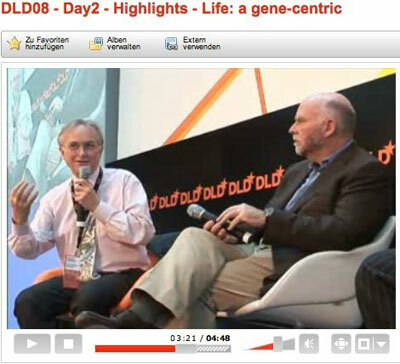 At the same time as this staggering conversation took place on the podium, between a radical genetic engineer and a mastermind in the science of genetics, who evoked a future with artificially designed life and DNA-printers that is already emerging from their current scientific revolution, directly next door a group of Web Entrepreneurs and venture capitalists were engaged in a heated discussion about social networks and earning opportunities. But next to the two dignified grey haired figures onstage, they suddenly seemed a little colorless—almost even a little outdated. When Richard Dawkins, the evolutionary biologist and dispeller of the God delusion, and Craig Venter, who first decoded the human genome, come together for their conversation, the audience feels privileged to listen in, and strains to follow their not-entirely-easy-to-follow lines of reasoning. The two thinkers are in agreement that, as Dawkins put it, "genetics has entered the realm of information technology." The growing understanding of our genetic makeup and the complex interplay of our genes has been "the biggest revolution in the history of human self-knowledge." Once a year publishing legend Hubert Burda invites the biggest names in science, economics and the arts to Munich. This year, Genome-decoder Craig Venter chatted with staunch atheist Richard Dawkins; Deutsche Telekom CEO René Obermann chatted with EU Commissioner Viviane Reding, and even one of the Facebook founders looked on. The conference is unique in its composition. For the fourth time Internet entrepreneurs, scientists, artists, CEOs, and bloggers descended on lovely Munich at the invitation of small media mogul Hubert Burda for the DLD Conference (DLD = Digital, Life, Design), whose purpose is none other but to save the world. Or at least to make it a “better place”, as is mission statement reads in English. A patron of the arts and a man of wide-ranging interests, who publishes a little bit of everything, beginning with the lightweight magazines “Focus” and “Bunte”, together with his guests turns his attention to the big important questions of our time. And because this is Munich, everyone is on-the-go and schmoozing. The Brazilian best-selling author Paulo Coelho talks about what inspires his work. The Italian photographer Oliviero Toscani reveals why he gave his models HIV tattoos in order to advertise sweaters. Wikipedia-founder Jimmy Wales talks about his plans to create a new commercial version of the ingenious not-for-profit online encyclopedia. And the CEO of the world's largest advertising agency, WPP, Sir Richard Sorrell, explains why he would choose to live in China today, if he could be 25 years old again. For three days, the conference brings to the quaint hometown of laptops and lederhosen the spirit of Davos, where the World Economic Forum will be held immediately afterward, and the perpetually fresh and innovative energy of Silicon Valley. There is always front row seat reserved for, alternatively, "Hubert", "Dr. Burda" or "Professor Burda". The Americans call him by his first name, the Germans and those who work for him use the academic title he earned with his PhD in art history. For some of the talks, seated next to the 67-year old is his wife Maria Furtwängler, 26 years his junior. The actress' role as crime investigator Charlotte Lindholm placed her among the ranks of glamorous television stars. She is there by choice, along with her daughter. Freshly coiffed and sitting very tall, hers is a very different look from her unmade-up, tomboyish television character, and she noticeably outshines her husband. She constantly fiddles with her Blackberry. The Patriarch of "Hubert Burda Media" and his family hold court. The bevy of young staffers who swarm around Burda appears almost blood-thirsty. In contrast, a second group of the DLD team stands out in grey hooded sweaters, adopting the more casual approach of the Google generation. Everything is photographed, filmed, blogged and posted quasi-live on the Internet. It is a conference held in real time, attended by invitation only, but whose discussions you can follow online without a problem. At one point, when not everyone can find a seat on the podium, the Patriarch intervenes personally. "Here is an empty seat," he says. At the conference's opening session, which is full of very rich, old, white men, Burda expresses gratitude to his children from his second marriage who have kept him up-to-date on their generation's digital life-style. He shares anecdotes about them, like how they once stole somebody else's stretch limo in Davos, which carry a single message: We are established, we are rich, and we have nothing left to prove. It must be very satisfying to, like Burda, be able to assemble so many interesting people and then deliver a universal course of study in art, and a crash course at the highest level in today's hottest topics in economics, science and technology. Craig Venter, who intermittently can be found crossing the world on his sailboat, is also a practitioner and man of action, who intends to connect business with science and environmental policy: "We are entering the design phase. We are creating the biological machinery of the future. " Venter does not have cyborgs in the Schwarzenegger-Terminator sense. He dreams of designer micro-organisms that could guzzle the carbon dioxide emissions that result from our addiction to oil and natural gas combustion, and convert the environmentally destructive gas into useable methane. A clever, imaginative scientist who, with his many talents is well-versed in theory and practice, lab coats and business suits, science and stock markets, Venter spread optimism in the face of the current climate hysteria and appetite for end-of-the-world anxiety: "The survival of our species depends on science," he said. And, with an ironic hand gesture toward his conversation partner's bestseller The God Delusion: "We cannot play God, if there is no God." With this volte-face Venter took the wind out of the sails of every skeptic, who had cast him as a present-day Doctor Frankenstein to be feared.